“I have had a superb experience with my mess kit here in Borden. The fit and finish is great and I feel like a million bucks when I wear it. For the first time in 26 years I feel comfortable at a mess dinner, thanks a lot. Please accept my sincere thanks for the quality of service and genuine care I have experienced through your firm and specifically from your representative Maria here in Halifax. She truly is a credit to your standards and was a pleasure to deal with. I look forward to dealing with you and Andrei Master Tailors in the future. 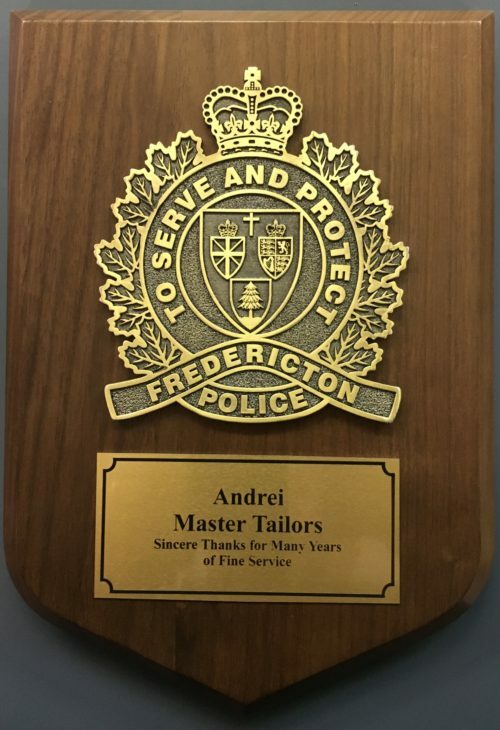 “I just wanted to take a long overdue moment to thank Andrei Master Tailors for the magnificent work they did on my mess kit and the service that they provided. Mine was apparently one of the first mess kits they made for Ruth’s Tailor Shop at CFB Borden and not only did it look great, it fit like a glove. It was made with the doeskin fabric and I am very impressed with how it looks every time I wear it. They delivered the finished product in just over 2 weeks!! And it was ready for Remembrance Day which I am sure is a busy time for uniform alterations. I had my initial measurements, a 1st fitting, and when my mess kit arrived it was perfect right down to the length required to work with the heeled shoes I wear with my mess kit. Again all in less then 2 weeks including my travel time and their delivery time from their shop to CFB Borden. It was certainly worth the drive. The 12 months no interest arrangement with CANEX is the icing on the cake. Every time I hear other Officers say they don’t want to get a mess kit because of the large one time cost, I tell them about the fantastic service you provided, the quality of my mess kit, and the convenience of the monthly payments through CANEX. I want to thank you very much for accommodating my order on such short notice and for making one of my favorite pieces of kit.